Have you always wanted to have chickens on your farm or in your backyard? Do you love farm fresh eggs? Many folks are venturing into chicken raising, especially those with farmland. There are of course benefits to having chickens, but it is important to realize about all that goes into ownership and care of these animals. What will you need to Raise Chickens? There are a few essentials that you must consider before buying chickens to keep them safe and happy on your property. Coop – A chicken coop is essential and most likely the most significant start-up expense. You can purchase a coop, build your own or convert a container of some sort for a unique look. This coop will need to be enclosed so that chickens can be locked up safely in the evenings to keep predators out. It should have a covered section for when the weather is bad and provide a nest box for each hen. An area for food and water and enough space for a person to enter is needed for collecting eggs. Be sure to plan enough room to avoid overcrowding. Each chicken should have at least 2 square feet of room. Tight quarters can lead to feather picking and disease. Feed & Water – Chickens will need to be fed daily with chicken feed as well as provided fresh, clean water. Space to move around – Space for chickens to spread their wings during the day is necessary. Depending on the size of your property, a fenced chicken run or area can keep them occupied during the day and happy. Just like their coop, the perimeter must be secure to keep out danger. Running chicken wire along the fence is an excellent way to protect them. Time – Just like any animal or pet, chickens will require some of your time. Daily feeding and watering, shoveling manure and keeping their coop clean, letting them out and into their coop and run each morning and night and maintaining the fence around their areas are things that will be required of your time. When properly cared for, hens can lay eggs from spring through fall. Eggs should be collected each morning and sometimes again later in the day. 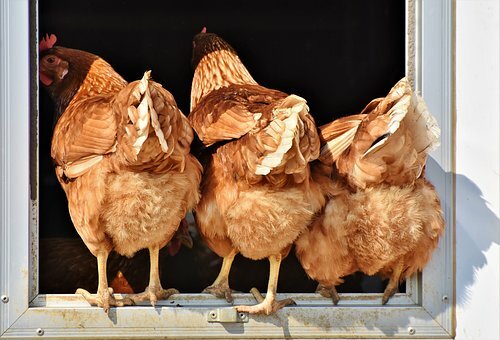 Loud cackle sounds from your hens may indicate they are laying eggs. Quick removal of eggs can help keep the hens themselves from eating them. Remove all broken eggs, cracked shells or any remnants that may encourage eating. If necessary wipe with a damp cloth and allow the eggs to air dry. Then mark them with the date collected and store them in the fridge for up to 1 month. Be warned, once you start sharing your farm fresh eggs with friends they’ll be coming back for more. Enjoy your chickens and their eggs for years to come with proper care and maintenance. Before you know it, you’ll be an expert chicken farmer.